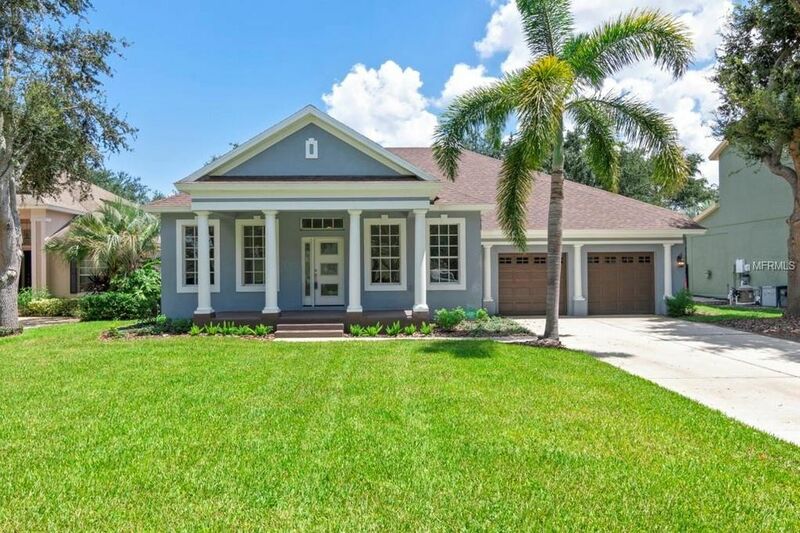 2018 REMODELED 4 BEDROOM/ 3 BATH HEATED POOL/SPA HOME IN GATED KEENES POINTE. BRAND NEW ROOF , NEW POOL MARCITE/NEW POOL & SPA HEATER, NEW POOL & SPA LED LIGHTING, NEW POOL PAVERS, NEW SEPTIC, NEW PORCELAIN FLOORING/NEW HIGH TRAFFIC DESIGNER CARPET, NEW GORGEOUS QUARTZITE COUNTERTOPS, NEW SOLID WOOD CABINETRY, NEW TOP OF THE LINE KITCHENAID APPLIANCES WITH 6 BURNER GAS COOKTOP, CONVECTION OVEN, 84 TALL FRENCH DOOR REFRIGERATOR. NEW LED PEEP-WINDOW DISHWASHER, TOTAL REDO OF MASTER BATHROOM & DIGITAL SHOWER CONTROLS IN ENSUITE BATH, NEW FLOATING CABINETRY IN ALL (3) FULL BATHROOMS. SUPER LARGE MASTER BEDROOM WALK IN CLOSET & EMERALD CUT CEILING WHICH GIVE A SPACIOUS-TALL-OPEN-MASTER BEDROOM FEELING!!! NEW SPRINKLER SYSTEM VALVES AND WIFI RAINBIRD TIMER, XTRA LARGE 2 CAR DOUBLE DOORED CARRIAGE GARAGE(S) WITH SEPARATE REMOTES, AND HIS & HER PRIVATE DOORS. GARAGE ENTRY INTO LAUNDRY WITH LIKE NEW WHIRLPOOL DUET (STEAM) FRONT LOADER WASHER & DRYER. NEW SOD & MONTHLY SERVICE BY MASSEY LAWN SERVICES, LARGE SOLATUBE SKY-LITE W/LED FEATURE IN KITCHEN AND COMMON AREA, NEW MODERN DESIGNER LOW E FRONT DOOR, NEW 8FT REAR FRENCH DOORS LEADING TO POOL/SPA/LANAI PAVERED AREA. PLENTY OF ROOM FOR A COVERED SUMMER KITCHEN AND INCLUDES AN ADDITIONAL 22X 20 PAVER DECK FOR SUNBATHING IN STYLE! BRAND NEW PENTAIR DIGITAL POOL & SPA HEATER. HOME WARRANTY INCLUDED!!!!! MLS# o5714145---SECURITY GATED & GUARDED-PATROLLED COMMUNITY. GOLF CART FRIENDLY COMMUNITY! JACK NICKLAUS SIGNATURE DESIGNED GOLF COURSE!!! Directions: CONROY WINDERMERE TO 6TH AVE TO CIRCULAR ROUND ABOUT- 3RD EXIT ON TO MAIN STREET. MAIN STREET TO STOP SIGN TO RIGHT ONTO CHASE RD. GO UNTIL ENTER GATED KEENES POINTE, --RT. ON TIBET BUTLER DRIVE TO RIGHT ON BOWDEN TO RIGHT ON CLAYMONT TO RIGHT ON KEMPER. "NATIVE BORN CENTRAL FLORIDA AGENT--THE JASON FULMER JKREW TEAM! ...CALL JASON TODAY.